﻿Conceptdraw professional Network Layout Diagrams will help you to clearly represent and communicate network layout, architecture, topology, and design to engineers, stakeholders and end-users. ConceptDraw has 1004 vector stencils in the 40 libraries that helps you to start using software for designing own Network Diagrams. You can use the appropriate stencils from Network Communication Plan library with 19 objects. Network Communication Plan library of vector stencils from Computer and Networks solution provides the 19 objects of design element for drawing the computer network layout diagrams. 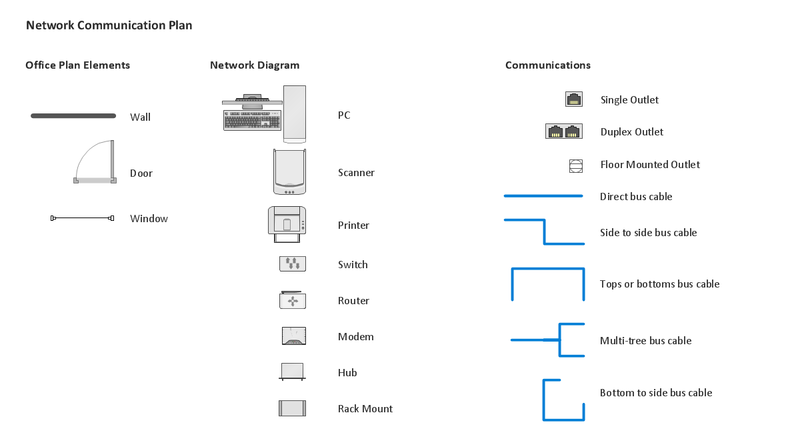 Use Network Communication Plan library to create your own network layout diagrams that show LAN and WAN architecture, topology and design against the floor plans. The library with 40 vector stencils is included in the ConceptDraw Value Stream Mapping solution. ConceptDraw DIAGRAM v12 is perfect for software designers and software developers who need to draw Active Directory Network Diagrams. ConceptDraw DIAGRAM v12 is perfect for software designers and software developers who need to draw Network Layout Diagrams.